I like to bike. It is my favourite commuting option. 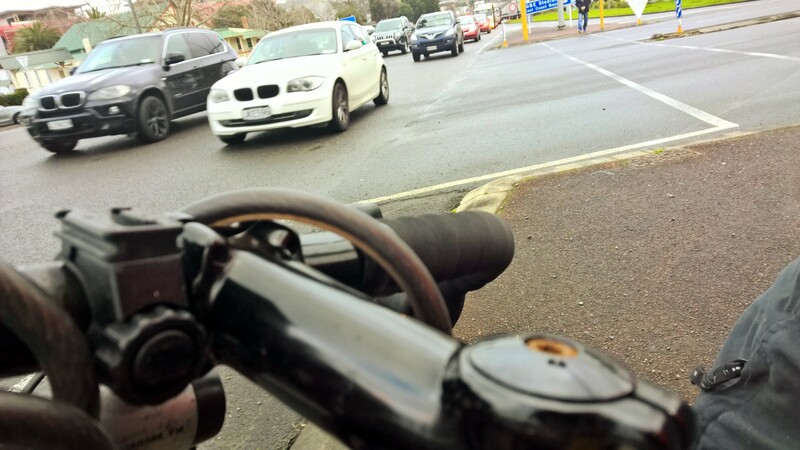 I started commuting by bike in the late 1990s when cycle lanes were non-existent in Auckland. I’m still cycling. Yet despite working at a University where showers are available, where bike racks are provided, I’m still in a tiny minority. The option to ride two-abreast for me is non-existent. Statistically speaking, practically nobody else is using these roads to cycle on. And over my years of experience, no, I’ve not ridden through a red light. In most cases I don’t have a problem with motorists. Often they’re traveling so slowly now, I’m moving faster along the cycle lanes available. Yet it is hard to ignore the motorists who remind you- daily- that this is not a safe option. They’re aggressive, they’re careless, they pose a risk. This year I’ve already been hit by a car that drove into me on a cycle-lane. Yesterday’s trip home required me to move into the traffic twice, as vehicles were parked in the cycle lane. That’s actually not legal. And then there was the driver of the Jaguar driver who had to blow his horn at me, for daring to use the same piece of road he wanted to. It’s odd that slowing for pedestrians is acceptable, and even driving slowly because of congestion is acceptable. Yet the rage some can experience at a cyclist astonishes me. I can understand why so many people are afraid to bike in Auckland. We’re not damaging the roads motorists are using, we’re reducing congestion, we’re reducing the point-pollution generated by masses of cars on the roads. We’re not the enemy of motorists.